Agnes Blythe and her glamorous Aunt Effie must take a break from restoring their inn to rake in the clues when a local mechanic is murdered in national bestselling author Maia Chance's charming second Agnes and Effie mystery. It's leaf-peeping season in Naneda, New York, and Agnes Blythe has settled into helping her eccentric Great Aunt Effie restore the Stagecoach Inn. It seems nothing can shatter the golden idyll--or the ka-ching of cash registers--until a mechanic at Hatch Automotive is found bludgeoned to death with a wrench. Sweeping into action, Agnes and Aunt Effie are on the scene, when a tourist-laden motor coach breaks down outside of town. The Stagecoach Inn isn't exactly ready for guests, but Agnes and Effie agree to take in a group of seniors while they wait for repairs. But then, Agnes finds herself pulled into the investigation when she learns her new boyfriend, gorgeous Otis Hatch, is the Naneda Police Department's prime suspect. 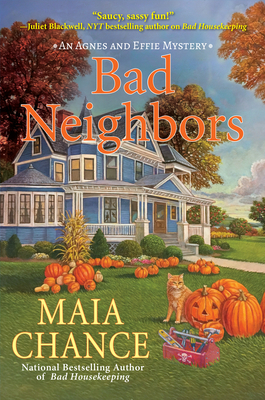 With bodies falling faster than the foliage, Agnes must leaf through the more viable suspects and clear Otis's name of murder in Bad Neighbors, the charming second Agnes and Effie mystery from national bestselling author Maia Chance. Maia Chance, national bestselling author, writes mystery novels that are rife with absurd predicaments and romantic adventure. She was born in rural Washington State, grew up in the small-town of Moscow, Idaho, and after living in upstate New York and Boston for a decade, she returned to the Seattle area. She now makes her home with her family on magical Bainbridge Island. This is her second Agnes and Effie mystery.